I had never made grits before, so I can’t even pretend to take credit for this recipe. But the grits turned out delicious, so I’m happy to pass this recipe along. Courtesy of Paula Deen (I know, I know). 1. Bring milk, water, and salt to boil in a large, heavy-bottomed pot over medium-high heat. 2. When the milk is boiling, gradually whisk in the grits. Stir until grits are well mixed and let the pot return to a boil. Cover, lower the temperature and cook for approximately 30 minutes, stirring occasionally. Add more water as necessary; the grits are done when they have the consistency of smooth cream of wheat. 3. 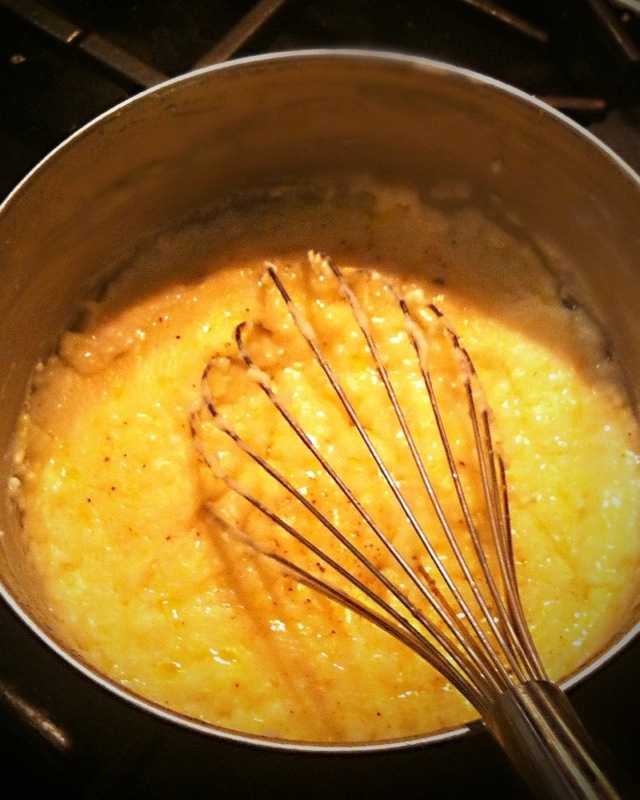 Remove grits from heat, and add the butter. Once the butter is melted, gradually whisk in the cheese a little at a time. Serve immediately.